NEW YORK — The women’s 800m was the highlight of the 110th Millrose Games as training partners Ajee’ Wilson and Charlene Lipsey both went under the previous American record at 800m with Wilson emerging victorious with the new American record of 1:58.27. Behind Wilson and Lipsey, Sammy Watson ran 2:01.78 to break Mary Decker’s high school American record of 2:01.8 from way back in 1974. The 800 was so good it gets its own separate recap here. The recap of the rest of the meet is below. 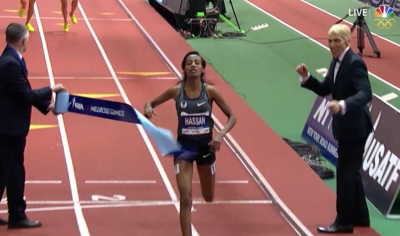 Highlights: Sifan Hassan won the women’s Wanamaker Mile in a Millrose record 4:19.89 as Kate Grace was second, Eric Jenkins won the men’s Wanamaker Mile in a world-leading 3:53.23, Courtney Okolo set an American record of 1:07.34 in the 500, Ben True won the 2 mile over Ryan Hill as Matt Centrowitz was only 7th, Katerina Stefanidi won the Olympic rematch with Sandi Morris in the pole vault, and Armand Duplantis set a high school record in the pole vault (18’10 1/4″, 5.75). We start with the distance action first. Full results on one page here. The race of the night on paper was the men’s 2-mile, and it didn’t disappoint, though surprisingly Olympic champion Matthew Centrowitz was never in contention, finishing a well-beaten seventh in 8:21.07. Rabbit Ford Palmer hit 1618 meters in 4:08.85, slightly behind the scorching 4:04 pace prescribed for the first mile, and the field was strung out single-file behind him with Kenyan Lawi Lalang the first racer (4:09.55 at 1618). Brit Andrew Butchart made the first major move with six laps to go and succeeded in creating some separation on the field, splitting 60.43 from 2018m to 2418m. But Bowerman Track Club teammates Ryan Hill and Moh Ahmed recognized the gap forming and had moved up right behind Butchart with 800 to go. 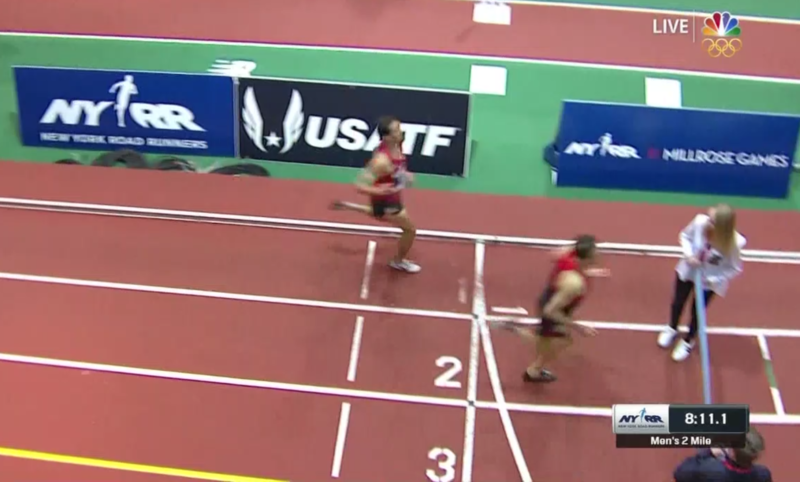 True, meanwhile, was in the second group (which included Centrowitz), almost two seconds off the lead in eighth place. True took off to catch the lead pack, running the next lap in 29.57, and by 400 to go it was down to him, Butchart, Hill and Ahmed. Hill moved to the front just before the bell, followed closely by True. We were in for an exciting finish. 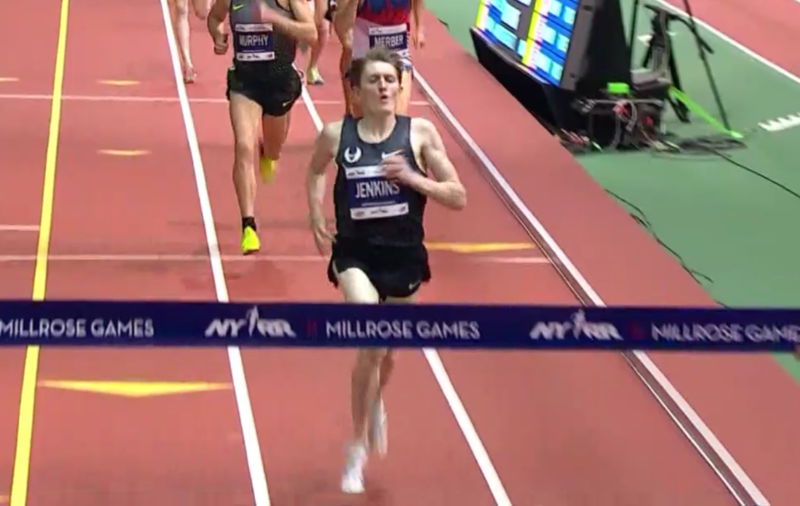 True pulled level as they came off the final turn, and, just like last year with Hassan Mead, Hill was in a battle to the line for a win at Millrose. But Hill and True didn’t just have each other to deal with: the people holding the finish-line tape were late in putting it out due to a lapped runner, and as a result the woman holding the far end of the tape was standing in lane 2 at the finish. Hill, running on the inside, held his line, while True, on the outside, veered to his right to break the tape. Ultimately, a disaster was avoided as True was able to create some separation on Hill, who ran out of gas a few meters before the line. True’s first indoor race since 2010 didn’t go that well — he was fourth at the New Balance Indoor Grand Prix two weeks ago in the mile (3:57.31), losing his balance and almost falling to the ground when he attempted to pass during the race. But today True ran like a savvy pro, moving smoothly late in the race to reel in the leaders and closing well over the final 200 (27.68). It’s not often that anyone gets the best of Ryan Hill over the final lap of a 3k/2-mile, but the hot pace took its toll on the field, as evidenced by Centrowitz’s struggles and Hill breaking stride just before the line. Hill said that he didn’t even realize that there was someone in his path at the end of the race and said it didn’t affect the outcome as he was out of gas by the final straight. But overall, he was very pleased with how he raced today, as he put himself in position to win late. Hill may go for something fast in Boston in a couple weeks (though that’s still up in the air) before USA Indoors, where he’ll attempt to defend his 2-mile title. Hill’s performance was impressive as it was his first race of the season. 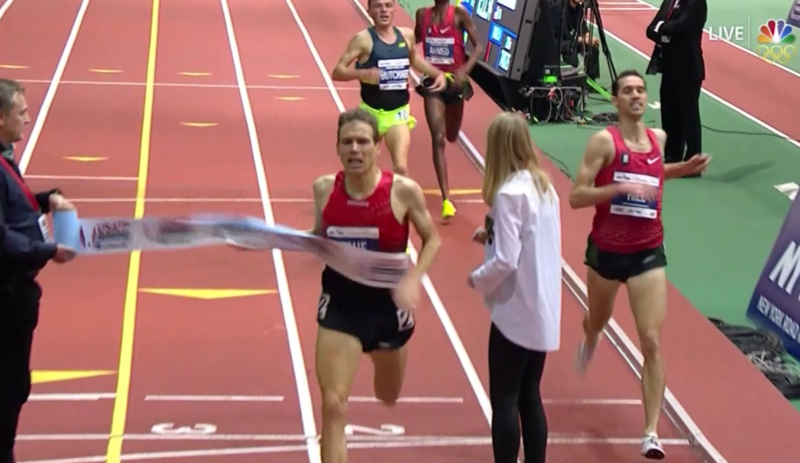 Centrowitz came through the mile slower than the 4:04 assigned pace and was still feeling sluggish and at that point knew the second half of the race was going to be tough. Even though Centrowitz said he didn’t feel great in either of his last two races, he’s not worried as his workouts have been going very well. “Maybe I’m just a little tired from some of the workouts still in my legs this last week, week and a half,” Centrowitz said. 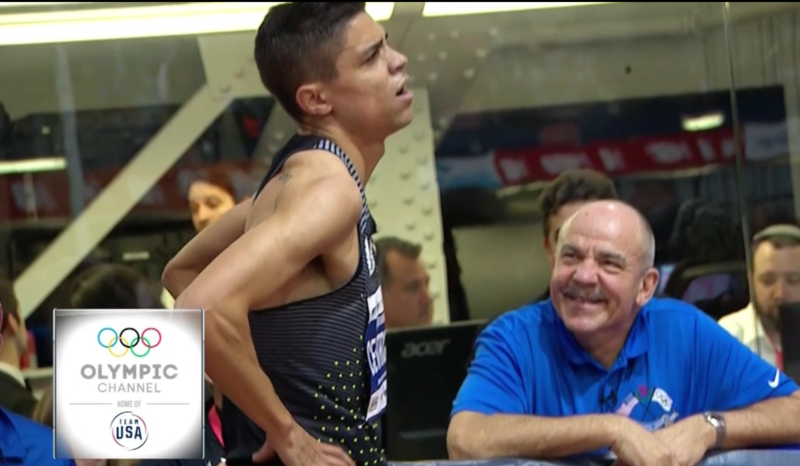 Centro does not plan to run U.S. Indoors. He’ll return to Portland, talk with coach Alberto Salazar and plot out his next move from there. This one took a little while to develop but the final 400 was full of drama. After rabbit Daniel Winn took the field through splits of 1:57.98 (809) and 2:27.48 (1k), Jenkins found himself in the lead. But with 400 to go, several guys were still within striking distance with Kyle Merber, Robby Andrews, Charles Philibert-Thiboutot and Clayton Murphy all within .62 of the lead. With 300 to go, Andrews began to fall back as native New Yorker Merber surged to the lead at the bell, drawing a huge roar from the packed Armory crowd. But Jenkins stuck right on him, and any dreams Merber had of a win at his home track were dashed on the backstraight as Jenkins moved to the lead just before the final turn and powered home to a big win in a personal best of 3:53.23 thanks to a stellar 26.90 final 200. Murphy wound up running Merber down too, clocking a PR of 3:54.31, while Merber took third in 3:54.67. If you want to understand how competitive American distance running has become recently, the seven mid-d/distance medals in Rio are Exhibit A. Exhibit B is Eric Jenkins. In his last two trips to New York, Jenkins has defeated Centrowitz — fresh off his Olympic title — at the Fifth Avenue Mile — and won the Wanamaker Mile against a strong field. And Jenkins isn’t even a pure miler! Yet as good as Jenkins’ kick is, he still came .06 shy of making the U.S. Olympic team at 5,000 meters last year — not because he choked, but because the guy who outkicked him for the final spot was the eventual Olympic silver medallist. “I’m like, I at least would have got bronze!” Jenkins added with a smile. But rather than continue to dwell on last summer, let’s focus on what Jenkins did accomplish today, which was to win the Wanamaker Mile. Jenkins was happy that the pace was relatively quick and wanted to ensure he was near the front and in a position to push hard over the final few laps. He did just that, and even when Merber took the lead the bell, Jenkins was confident he had enough left in the tank for the win. Murphy didn’t run badly by any means today, but he was disappointed that he allowed a gap to form midway through the race (he was 5th with 400 to go), forcing him to navigate traffic over the final lap. Murphy has run some outstanding tactical races (particularly the Olympic semis and final), but it should be pointed out that he is still only 21 years old. He knows as he continues to gain experience against fast fields, he’ll hone those tactics even more. Murphy also pointed out that one of the differences he’s noticed between being a pro and a collegian is that every field he faces is good. Nine years ago Kyle Merber beat “Bobby” Andrews to win the high school Millrose mile at the Garden. He made a bold attempt to become the first person to win the high school and Wanamaker Millrose miles today. He came up short the final 100m, but his move today at the bell was a strong one. Not having Matt Centrowitz in this race opened up the minds of a lot of guys in the field and Merber’s bold move can only benefit him in the future. We expected this race to come down to Hassan, Rowbury and Kate Grace and that’s exactly what happened as those three plus rabbit Lauren Wallace were clear of the field at the halfway mark (2:12.34 at 809 for Wallace, 2:12.62 for Grace). Grace only held the lead for one lap after Wallace dropped out after 1000 meters, however, as Hassan assumed control with just over 400 to go and began to gradually ratchet down the pace. No one had dropped after a 32.37 third-from-last lap, but Hassan then ripped a 31.44 penultimate lap. Though all three women were within a second of the lead at the bell, Rowbury and Grace were starting to hurt. Hassan really opened up over the final 200, covering it in 30.44, and Rowbury and Grace had no response. Hassan cruised to the win unchallenged, running a meet-record 4:19.89 (becoming just the fourth woman ever to break 4:20 indoors) as Rowbury and Grace battled to the line, Grace nipping Rowbury, 4:22.93 to 4:23.05. With Genzebe Dibaba, Laura Muir and Faith Kipyegon, plus Americans Jenny Simpson and Shannon Rowbury, the women’s 1500 is a loaded event right now. So we’re not going to make any snap judgments about Hassan’s future based on one race. Remember, she was dropped hard in a couple of 3k’s earlier this year. With that said, Hassan’s run tonight was tremendous and she could be even stronger come outdoors once she’s had time to fully adjust to new coach Alberto Salazar’s system. Hassan said that she’s been doing more fast sessions under Salazar (5x a week vs. 2-3x a week under her old coach) and in Boston two weeks ago noted how much she appreciated the athletic training resources available to her with the Oregon Project. While it’s a bit much to ask Salazar to turn Hassan into an unbeatable winning machine a la Mo Farah, it should be pointed out that Hassan was a lot better in her event (2015 World silver, 2016 World Indoor gold) than Farah was in his when they joined Salazar. Grace had a breakout year last year making the Olympic 800m final and her fine 2017 indoor campaign continued tonight with a 5+ second PR in the mile of 4:22.93. She was particularly pleased that she stayed tough late in the race and was able to outkick a stud like Rowbury at the end. Her time puts her #4 on the all-time U.S. indoor list. Even though Rowbury has had a longer, more successful career than Grace to this point, this wasn’t the first time Grace had beaten her. In fact, Grace’s head-to-head record against Rowbury is now an impressive 4-1. Grace said that she’ll run both the 800 and 1500 outdoors, but feels that she has more experience to gain in the longer event after focusing on the 800 for most of her career. Before that, though, she’ll run the 1000 in Birmingham next weekend against Laura Muir, a race Grace is very excited about. In each of the past three years, Rowbury has talked about challenging Mary Decker’s 4:20.5 American record at this meet. Ironically, though Rowbury came closest to that mark today (her time of 4:23.05 as an Armory facility record), that was only good for third place against a tough field. Garcia, who was 5th in the steeple at last year’s Olympic Trials, had a three-second lead at 1600 (4:42.85) and looked to be pulling away to a comfortable win. But once rabbit Ashley Higginson (now sporting a Hoka One One singlet) dropped out at 2k, Canadian Kate Van Buskirk worked to reel her in and was on her shoulder with 600 meters to go. From there, Van Buskirk played sit and kick, running behind Garcia until midway through the final turn, at which point she made a hard move and dropped Garcia easily, pulling away to win in 8:52.08 to Garcia’s 8:53.48 thanks to a 33.42 final 200. Reigning NCAA champ Molly Seidel of Notre Dame was a late scratch after tweaking a muscle on her warmup. 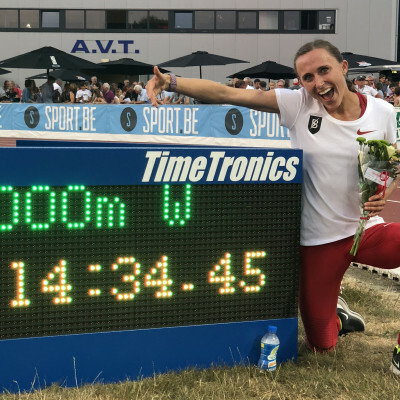 For Van Buskirk, the 2014 Commonwealth Games bronze medallist at 1500, this was a 20-second PR and another sign for her that she’s on the comeback trail after being diagnosed with an autoimmune disease a year and a half ago. One of the effects of that disease was inflammation in her pelvis, and as a result she only raced five times last year. 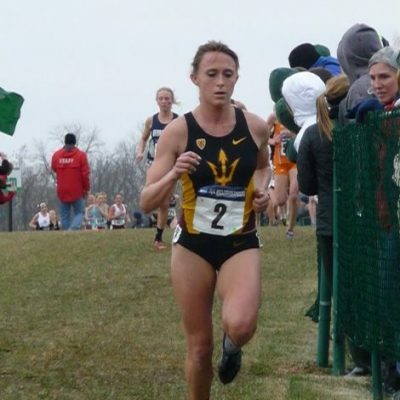 Now she’s more focused on her stride during races and feels that she’s seeing the benefits. “I feel like I’m able to flow a lot more now,” Van Buskirk said. Several of the guys in this race were 800 men moving up, which played to the advantage of 800/1500 man Kidder, who broke the collegiate record at Penn State last year (2:18.26). 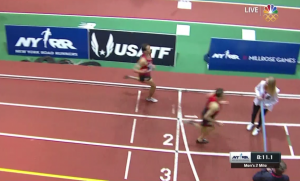 Olympic 5k finalist and American 1k record holder David Torrence tried hard to gap the field but couldn’t quite manage it, and Kidder was able to catch him just before the final turn and run away with the win in 2:19.92. Kidder’s fellow Brooks Beasts PSU alum Cas Loxsom managed to edge Torrence for second, 2:21.06 to 2:21.43. The 1k at USAs won’t be easy (Robby Andrews is running it, and Clayton Murphy may as well), but Kidder will like his chances as he’s strong at both the 800 and 1500. He said his training has been going very well recently but that he still needs to add some strength as his focus will be the 1500 outdoors. Brazier said his plan was to run near the front in second or third, but he quickly realized that was what everyone else was looking to do as well. As a result, he wasn’t in good position early (8th after 400) and when Torrence began to push midway through, he wasn’t able to respond and wound up getting gapped. Though Brazier gradually moved up to finish 4th in 2:21.79, he knows he can’t afford to spot his opponents that much ground and contend for the win. Brazier was in good spirits, however, and especially proud of former Texas A&M teammate Jazmine Fray, who broke the collegiate 800 record this afternoon. “I was blown away,” Brazier said. “I knew she was talented. I knew she could break it. I just didn’t know if she knew that. The talk before this one centered around high schooler DJ Principe’s sub-4:00 attempt, but the star today was 2015 NCAA mile runner-up Cristian Soratos, who dusted the field over the final 600 to win in 3:54.23 — a time that tied Andrew Butchart’s world leader (though the world leader was later lowered by Eric Jenkins in the Wanamaker Mile). 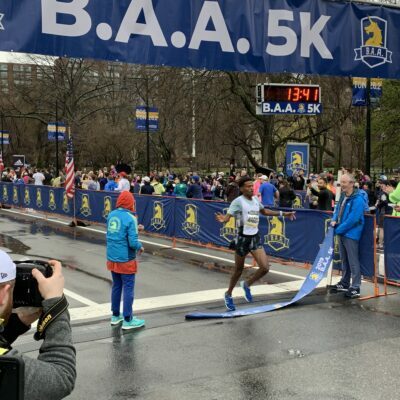 Soratos, who ran 3:57 in Boston two weeks ago, got out well early behind rabbit Brian Gagnon and took over once Gagnon dropped out after five laps. From there, Soratos went 28.53-28.85-28.76 to the finish line to win by five seconds over Penn’s Chris Hatler, who went sub-4:00 for the first time. Soratos struggled a bit with the higher level of competition in his first full year as a pro in 2016 with Big Bear Track Club; he didn’t even make it into the Olympic Trials (Dusty Solis was the last guy in at 3:39.32; Soratos ran 3:39.33). But he’s now back under college coach Lyle Weese in Bozeman, Montana, and is feeling good again, as evidenced by his one-second PR today. The pro field events saw the Olympic champs Derek Drouin in the high jump and Katerina Stefanidi in the pole vault both emerge victorious. Drouin jumped 2.27 to win, below his season’s best of 2.33. Stefanidi had to bring her “A” game as she faced Olympic silver medallist Sandi Morris. Stefanidi’s 4.82m clearance was a 2017 world leader. There wasn’t a men’s pro pole vault but if there was, it likely would have had the same winner as the high school event as junior Armand Duplantis vaulted 5.75 (18’ 10 1/4″) to not only win by over 2 feet, but to break his own American high school record and have the #5 mark in the world. Amazing. Armand can’t get too cocky because he still doesn’t have the family record. His dad Greg vaulted 5.80 (19’ ¼”). Duplantis is a freak show talent who first set the high school record last year as a sophomore. When Millrose was at the Garden it was known for having races at odd distances. That tradition has carried over a bit to the Armory as there was a women’s 300 and a men’s and women’s 500 here, in addition to the short hurdles and sprints. The big news was Courtney Okolo set an American record in the 500. Okolo, the 400m specialist who won a 4×400 gold last year, was facing Olympic 400m hurdle gold medallist Dalilah Muhammad and 800m runner Alysia Montaño. If you were worried about Okolo racing beyond 400, you shouldn’t have been as she smashed the American record running 1:07.34 (previous record 1:08.70 from Shana Cox). Vernon Norwood beat former world record holder Brycen Spratling in the 500, as Olympic 400m gold medallist Shaunae Miller (come on, you remember here for diving across the line and ruining the golden hopes of Allyson Felix) won the 300 in 35.71 over 400m hurdles bronze medallist Ashley Spencer. Olympic hurdle champ Omar McLeod easily won the short hurdles here, as Phylicia George won the women’s hurdles. Former NCAA 200m champ Dezerea Bryant won the women’s 60 as Clayton Vaughn (9.93 best, went to UTA) won the men’s 60. Montaño only spoke briefly to us after her 500-meter race as she wasn’t feeling well, but we were able to ask her about Russian doper Mariya Savinova being stripped of her 2011 and 2013 World Championship. Montaño stands to be elevated to two bronze medals if the IAAF reallocates the medals. Montaño said that she didn’t think much of it when she initially found out about it through her Twitter mentions as she was flying to New York yesterday; people had congratulated her in the past only for nothing to come of it. This time, it does appear that Montaño will eventually end up with the medals she deserves, but nothing can replace the moments that Savinova stole from her. *Full 2017 Millrose Games results on one page here.